Rev. John "Jack" R. Gavin, O.S.A. Our brother John R. “Jack” Gavin, O.S.A. died during the morning of February 22. He was 91. Jack professed first temporary vows in the Augustinian Order September 10, 1943, and solemn vows September 10, 1946. He was ordained a priest June 5, 1948. He studied at Chicago Teachers College for one year before seeking admission to the Augustinian Order as a Postulant in 1941. He earned a B.A. in Philosophy from Villanova College, Villanova, Pennsylvania, in 1945. He completed the program of theological studies at Augustinian College, Washington, DC, in 1949. He earned an M.A. in Sociology from Catholic University of America, Washington, in 1950. He did additional studies at DePaul University, Chicago, and St. Louis University, St. Louis, Missouri. He was awarded the degree of Specialist in Education by DePaul University in 1963. Teaching, coaching, and administration of schools were the focal points of Jack’s earlier ministries. He was a teacher and Assistant Rector of St. Augustine Seminary, Holland, Michigan, from its opening in 1949 until 1951. He taught and coached at St. Rita High School, Chicago, from 1951 to 1954. He was at Mendel Catholic High School, Chicago, from 1954 to 1963, serving at various times as teacher, Athletic Director, Director of Guidance, baseball coach, Assistant Principal and Director of Studies. He was President of the Chicago Catholic League in 1958-59. From 1963 to 1979, Jack was Principal of three Augustinian high schools: St. Augustine Seminary (1963-68), Augustinian Academy, St. Louis, Missouri (1968-72) and Mendel Catholic High School (1972-79). He served as Director of Development at Mendel from 1979 to 1982. Parish ministry occupied Jack’s life beginning in 1982. He was Administrator, and later, Pastor, of Immaculate Conception/St. Henry Parish, St. Louis, Missouri, for the next 23 years. As Pastor, he not only ministered to the spiritual needs of the people, but also organized an extensive outreach program to help meet the material needs of the poor of the neighborhood. In 1983 a former post office near the church was remodeled and dedicated as the Parish Outreach Center. At that time, Jack spoke of his "dream of having a place where we can better serve our neighbors and also bring our parishioners together for serious social concerns.” The Outreach Center was renamed “Fr. Jack R. Gavin, OSA Outreach Center” in 2006. Jack served as Pastor of Immaculate Conception/St. 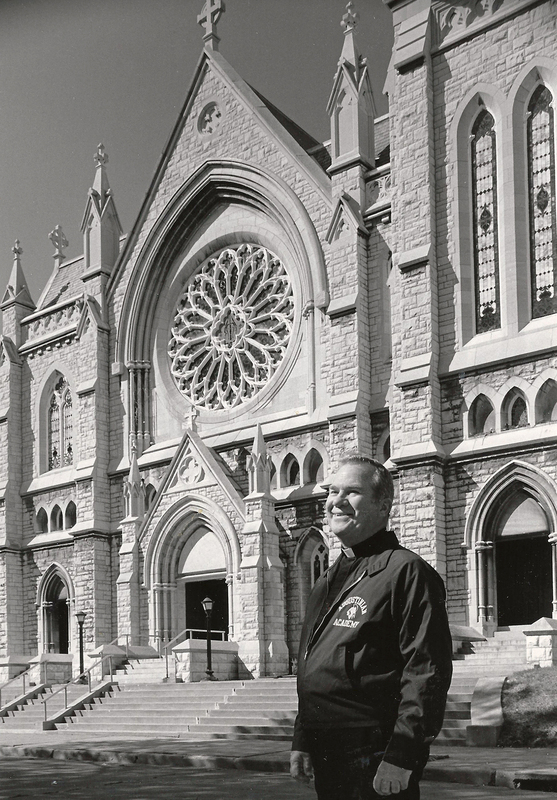 Henry until 2005, when the parish was one of ten closed by the Archdiocese of St. Louis as part of its consolidation plan for the South portion of the City of St. Louis. Jack resided at St. Nicholas of Tolentine Monastery, Olympia Fields, Illinois, from 2005 to 2010. In 2010 he moved to the newly formed Bl. Stephen Bellesini Friary, Lemont, Illinois, where he died February 22 following a long period of slowly declining health. Jack is remembered for his compassion and caring toward all, especially anyone in need. Augustinians recall his leadership in the 1970's when he spoke forcefully in favor of the democratization of the Order’s government. St. Louis Post-Dispatch columnist Jerry Berger, writing in 2000 about a fund raising event for the Outreach Center, observed, “At one point in his career, the Rev. Jack Gavin could make a future judge feel guilty, a pro football player tremble, a top numbers-cruncher forget how to add and subtract, and silver-haired prosecutor stammer.” The writer was referring to Jack’s former students, who were heading the fund raising committee. Father Jack was honored at the 2014 Augustinian Gala on April 25, 2014. Thank You, Friends of Tolentine!